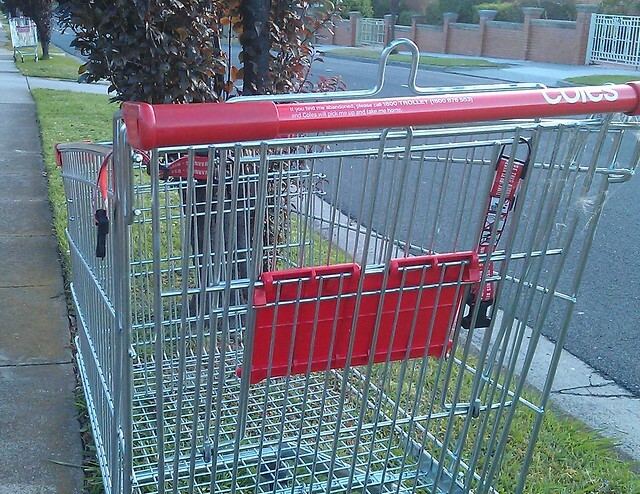 Shoalhaven Council have threatened to recycle all abandoned trolleys so Coles/Woolworths will be installing coin systems on their trolleys here in Nowra. Won’t stop the locals who push their groceries/kids home in the trolleys to East Nowra. Just means they’ll now have to cough up $2 to do it. I liked the trolley system they had at Walmart in Waikiki. Wheels locked if you pushed them out of a certain perimeter. I understand the argument about coin deposit reducing abandonment, although I’d be interested to know how universally this applies (our local Woollies trolleys turn up Skeleton Creek, coin deposit notwithstanding). Still, I won’t argue the toss on it, I’m sure on balance you’re right. I would imagine the reason is probably cost-benefit for the supermarkets though – cost of new trolleys vs number of ones lost or stolen, and maybe a smidgeon of customer convenience? Woolworths gave me a little keytag thing with a fake coin in it. I take the fake coin from the tag, stick it in the trolley and go shopping, then put it back in my keyring when I’m finished. The only trouble with it is the annoying trolleys used by some shops, which idiotically only accommodate a $2 coin (usually Aldi). My $1-sized fake coin doesn’t fit them. Why make a trolley that can only take a $2 coin? It’s not as though someone will be more careful with a trolley if they’ve deposited $2 than if they’ve only risked $1. Limiting it to one coin size pretty much halves the chance that I will have the correct coin. I could have half a dozen $1 coins. The $1 trolleys also accept $2 coins. It’s not hard to do. Re: the drink containers having a deposit in S.A, other states have tried to introduce the same scheme but have been thwarted by the beverage companies campaigning against this idea (which was working well in NSW when I was a kid) I guess big business know they can control public policy like the mining tax and pokie reform. The shopping trolley issue is worse in some areas due to ppl shopping without a car and seeing the trolley as a convenient transport option for their groceries, $2 is cheaper than a taxi. You see many more abandoned trolleys in poorer areas. There was no compulsory container deposit legislation in NSW “when you were a kid”. There never has been any. A few companies had voluntary schemes for their specific, and re-usable, distinctive glass containers. Enno, your correct the deposit didn’t apply to all containers only some glass bottles which had a 5c refund when returned to any shop which sold them. This did mean that there was much less of these littering the landscape. We are talking about late 60s and early 70s. It would be interesting to know if Woolworths voluntarily introduced deposits in Bentleigh, or whether pressure was applied to them. I have shopped in stores in the US that had the automatic wheel locks installed on the carts which were set to lock when the cart goes over a line at the edge of the parking lot. This does not stop some people from continuing to try to push the cart home wearing a flat spot on the locked wheel. These carts eventually make it back to the store and the wheel with the flat spot goes THUNK,THUNK,THUNK as you push your groceries. I have had to get used to the carts/trolleys in Australia as all 4 wheels swivel around on Australian carts making them somewhat harder to control and steer around turns. All carts that I have ever used in the US have fixed rear wheels and they are thus easier to steer. A lot of customer don’t like having to pay a deposit for a trolley. Its all well and good for the people whose local supermarket has the carpark right in front. Where I live, to get from the supermarket to the car park, I have to take a lift, walk through a furniture store, cross the main road on a bridge, and then take another lift to get to the carpark. Do I want to take the trolley all the way back ? Umm no. The trolleys go in a rack in the carpark and the supermarket sends a guy with a tractor to collect them each evening. The two Aldi’s nearest me are both even further from the carparks in their respective shopping centres and probably a reason why nobody except pensioners who have all day to burn pushing trolleys around shop there. I stopped carrying a purse because figured it will it would reduce the odds of getting bashed and robbed. All I need is a plastic card and car keys, both of which fit easily in my pocket. The only time it caused a problem was when I thought I would to try a new supermarket for the weekly shopping not knowing they had trolleys that needed a coin. I got back in the car and went somewhere else. Safety first. @Amanda, you think not carrying a $1 coin will somehow avoid you getting bashed or robbed? Sorry, but that sounds like paranoia, not safety. @Phillip, Aldi also makes a fake $2 that goes on a keyring for theirs, so you could get the Aldi one, and use it on both variants. A few weeks ago, I noticed that about 20% of the trolleys at the local Woolworths were new and they were of the coin variety. They were not making any attempt to chain them up, it wouldn’t work anyway unless they all had the chains on them. Today there were two signs stuck on the wall saying that no coin was necessary to use the trolley. I guess the manager got sick of customers querying him about it. It wouldn’t surprise me if that changes again in a few weeks though. THe big question is, do people care about abandoning a trolley in the carpark with a 1 or 2 dollar coin in it?